One of the more interesting problems we faced during the development of Zero Tolerance Hero was how to clear the screen of the enemies that the player is clearing from the streets. One non-violent solution was to have the enemies simply jump out of the way. 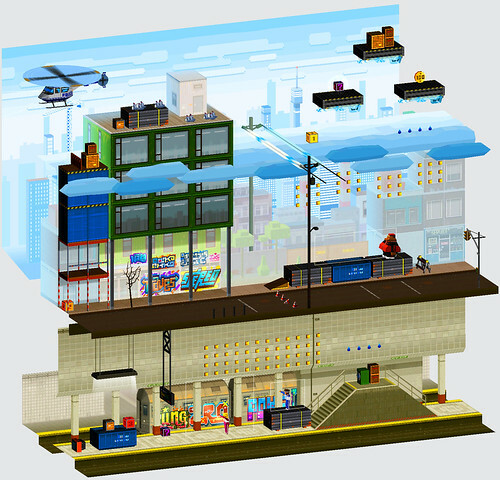 We tried elaborate animations for this approach but the result just looked confusing. We also tried splitting every object into smaller ones and making those fly off the screen. This meant a lot of extra work for every single object in the game and proved also to be problematic gameplay-wise as the player might get hit by the falling pieces. Finally we came up with the perfect answer: ragdoll physics for the characters combined with everything dissolving into a rain of cubes. 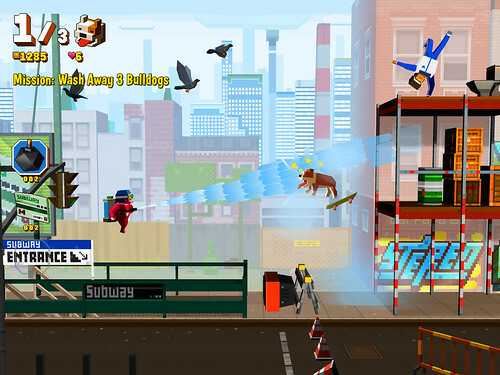 This effect was emphasised with comical popping sounds, to keep the rating of the game comfortably within the range of “Mild Cartoon or Fantasy Violence”. 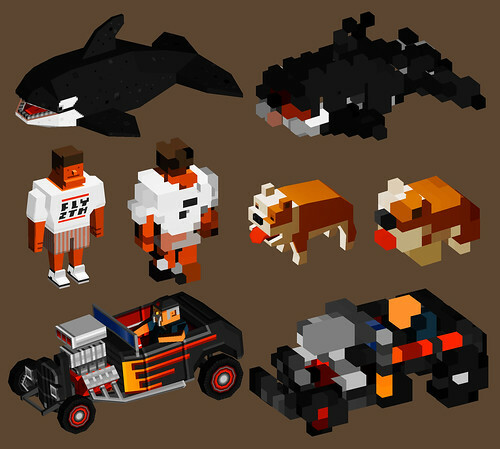 It didn’t hurt that the cubes were also a perfect fit with the pixelated style of the game. Sami used his magical powers to cook up an amazing script that scans the object geometry and colour palette for the object and then pre-calculates a separate “cubified” version. The disappearing enemy is switched to this cube version on the fly and all those cubes are set flying. Problem solved! 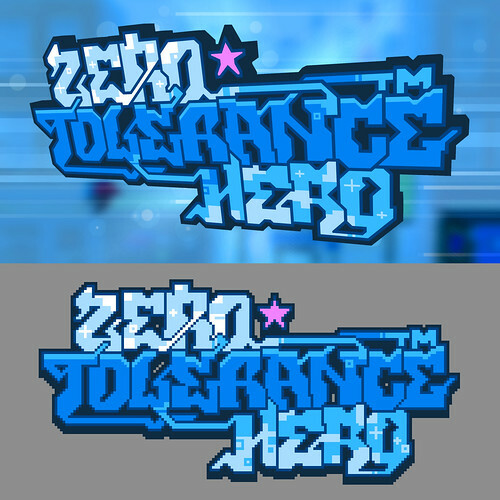 Zero Tolerance Hero is now live for iPad in the Nordic Countries and New Zealand. Follow this link to the App Store. So far we have been sending stickers, badges and t-shirts all over the globe. This time we are back to stickers! 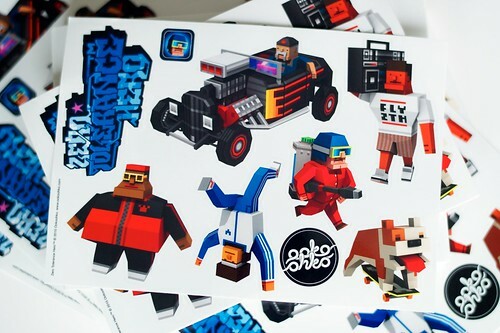 Send us an email to stickers@ookoohko.com with your mailing address. We prefer to send stuff as far away from Helsinki as possible, but our Lady Fortuna is quite random so it’s a good idea to test your luck regardless where you live. This competition is on until we run out of stickers. For full disclosure, we will be holding onto your email address and might be using it in the future for sending out information on what we’re up to. So far we have sent none. However, we will never share your personal information with anybody else.